Hello, welcome back and I hope everyone had a great Christmas and New Year. I was lucky enough to get a Fat Face gift card. Regular readers will know I like Fat Face. Casual clothes, watch some of the patterned excesses if you're my age but good quality, nice design. You get the picture. So I went online to the site and found they had a rather nice pair of black Chelsea Boots (I'd have preferred the brown but they'd sold out, fair enough). Casual, slightly beaten-up looking, really nice for casual wear. I haven't got them though. And why not? Because like so many other retailers they don't allow you to use gift cards over the Internet when the cards were bought in a shop. This is far from unique to Fat Face. Last year I had a WH Smith gift card (by now a useless shop I'm afraid; when I asked on the week of its release whether they had the Blu-Ray of "The King's Speech" they didn't, whereas every other DVD retailer in the universe had made damned sure they had loads - WH hadn't even stocked it in the first place) and once again, I could only use it in actual premises. I'm sure there are technical reasons it's difficult to have a preloaded and top-uppable card working online. No doubt someone from IT would be able to explain it to me. But as a tech journalist since 1989 guess what - I don't care. If you're a High Street retailer you're going to be under threat by now from the online world, and if you have an online presence as well then your gift tokens need to work seamlessly - or else I'm going to start buying my gift tokens elsewhere next year. A stereotype says men hate shopping. Personally I don't - but I do like a business to accept genuine money when I offer it regardless of the channel. It's now 2012 - retailers, your New Year's resolution needs to be to make buying with you a seamless experience, whether the customer is in front of the computer, on a smartphone or in your shop. It's because too many of the idiots in charge of retail treat bricks+mortar and online as separate channels. The most moronic even let/make them compete with each other. And another thing....I just had to chuck out three gift cards because they had expired after just over one year. Can explain to me why a gift card, which is fully paid for in cash ever expires? I really think that should be against the law. oh yes this has just happened to me too. My son had a gift card for Game which we tried to use online - never occurred to me that you wouldn't be able to. But the website wouldn't take it, so we had to trudge down to the nearest Game store, only to discover that the Wii game he wanted was about £5 more expensive instore. What a rip off. In future I think we'll stick to Amazon vouchers. I agree, Joanne - with regret, a good way to damage your business is to ensure there's no streamlining. That said, web-only promotions are fair enough - if you don't mind losing as many customers as you gain. Sarah, I think it was Lee Mack who once said a gift token was a good way of "ruining money" - take cash which has no expiry date, hand it over and then watch it expire. 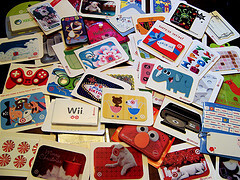 That said, I can see it's not reasonable to expect someone to keep track of all of these cards over years - maybe there ought to be a way of 'banking' them for online purchases? Bryan, I'm not a retail specialist but your point seems valid to me. If, on the other hand, there's a retailer reading who's able to explain why it makes business sense to set one of your sales channels against the other, please feel free to chip in - I'm genuinely interested. Gift cards are so practical but they should come with a caution brand examining, "This products may be dangerous to your wallet ! few online stores are very risky to buy..
All printable cards design and good quality to be. It through many cards begin like to every peoples.